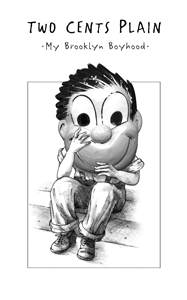 A graphic memoir of family and identity set in a storied borough of the American immigrant experience. 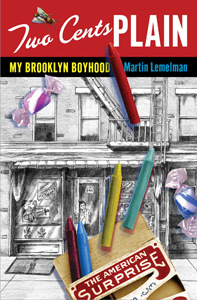 Martin Lemelman’s elegiac and bittersweet graphic memoir, Two Cents Plain, collects the memories and artifacts of the author’s childhood in Brooklyn. The son of Holocaust survivors, Lemelman grew up in the back of his family’s candy store in Brownsville during the 1950s and ’60s, as the neighborhood, and much of the city, moved into a period of deep decline. In Two Cents Plain Lemelman pieces together the fragments of his past in an effort to come to terms with a childhood that was marked by struggle both in and outside of the home. But his was not a childhood wholly without its pleasures. 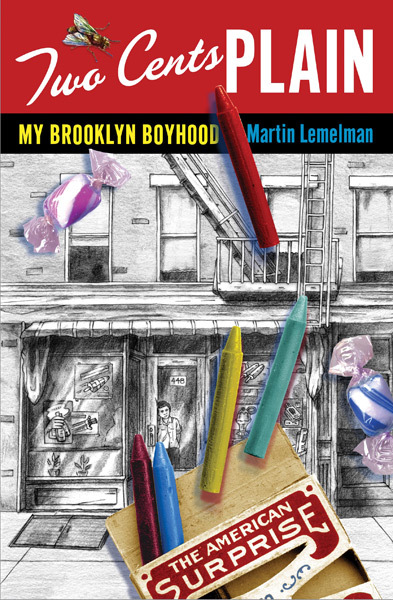 Lemelman’s Brooklyn is also the nostalgic place of egg creams and comic books, malteds and novelty toys, where the voices of Brownsville’s denizens — the deli man, the fish man, and the fruit man — all come to vivid life. Between the lingering strains of the Holocaust and the increasing violence on the city’s street, Two Cents Plain reaches its dramatic climax in 1968 as Lemelman’s worlds explode, forcing him and his family to recreate their lives again. Through his narrative and richly rendered black-and-white drawings, family photographs, and found objects, Lemelman creates a lush, layered view of a long lost time and place, the chronicle of a family and a city in crisis. Two Cents Plain is a wholly unique memoir and a reading experience not soon forgotten.